known for turning up huge match bags of flounders, eels, codling and whiting. The boat fishing is pretty good, too. If you’re in need of getting your rod tip rattled, then this is the place to try. 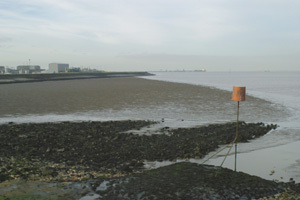 The water in River Humber, especially around Grimsby to Immingham, is chocolate coloured. But, over the past few years the quality of the water has improved, thanks to better environmental controls for the surrounding chemical factories. This in return has had a beneficial effect on the fishing. From the end of September, when the whiting arrive, until around the end of April when the cod and the last of the whiting make off for colder water, sport can be superb. As far as summer species go it is a typical estuary, with flounder and eels, but each year more and more bass are coming up the river. Flounder fishing can be magic and there are several big matches run along this stretch each summer. The beauty about fishing the river is that you do not have to have rough seas to cope with. There are spots to fish on every big tide and areas that you should catch fish on most occasions. There are also very few days when the river is unfishable. To get here, join the A180 and take the turning signposted to Immingham and Stallingborough. Keep going and go straight over two roundabouts, then turn left at the third. In front of you is a big chemicals works, this is Millennium Inorganic Chemicals, go past the factory and you will see a track, which is the entrance to the wall. You will see a barrier across the entrance, a normal size car or small van will go under it – it’s okay to go under this! You then come onto the wall. On smaller tides, go to the left to an area called the woods. To the left of the wooded area is bay 30 – a good place for the bigger fish. Cast towards the large jetty to the left of you. This is a well-known cod mark, but in the summer it holds some very good eels. Fish close in with crab in the summer. If you fish the pipeline at the woods give yourself plenty of room as the currents can be quite strong at times, and your line can easily become wrapped around the pipe. The tide runs to the left as it comes in, and to the right as it goes out. The Yellow Cross is popular with match anglers on roving matches. There is a decent tidal flow on even the lowest of tides, especially if you cast a good distance. It’s an out-and-out winter mark, and can be a bit of tackle graveyard. Beware of the edge of the tarmac – it’s common to lose fish here. Go for a stronger main line of around 25lb and a powerful reel like the Penn Mag 525 or Daiwa SL20SH. Bay 26 is the most popular mark in the winter and is well known around the county. This bay fills up with water quickly because it is very deep, and on bigger tides you may struggle to hold bottom – so cast short. Lugworm and squid are the most successful baits, although lug tipped with ragworm can also be a winner, especially if there are plenty of whiting about. Further along the coast is a stretch called the Courtaulds Straight. This is so named because the factory behind it used to be called Courtaulds. This mark is only fishable for around four hours, two up and two down. It fishes well all-year-round, and distance casting can pay off in the winter months. In the summer, 10 yards can be too far as the fish come in to forage around the rocks for food. There’s no need for heavy tackle here, either. This used to be a summer-only venue and produces some monster eels and, more recently, bass. It’s a muddy area and the tide takes its time to reach the wall, but don’t let it put you off. If it is possible to reach the water, simply cast out and feather your line so the lead doesn’t become embedded in the mud. Then give it a quick pull to make sure that it’s clear and you can catch from the off. Treble shots are not uncommon on the first cast! From Novartis to the Huntsman Tioxide factories you will catch flounder and eels in good numbers, and even the odd dover sole. In winter the Novartis area has been very good for whiting and codling, especially on the bigger tides fished at distance with lugworm and ragworm baits. Humberside Angling Centre, 63 to 67 Pasture Street , Grimsby. Tel: 01472 269888. Sparkes Brothers, 43 Cromwell Avenue, Grimsby. Tel: 01472 342613. Cleethorpes Angling Centre, 291 Brereton Avenue, Cleethorpes, Tel: 01472 602002.